This weekend marks the start of something great here in Miami, with III Points Music, Art, Technology Festival shaping up to be a landmark milestone in the cities cultural almanac. 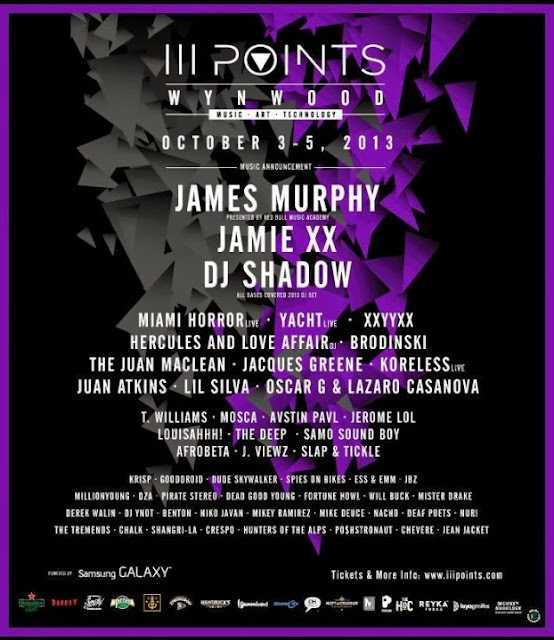 If you've been living under a rock for the last few months, III Points is an October festival of art, music, and technology in Miami. The festival is collaboratively put together by the local nightclub Bardot and the UK label Young Turks. There is something for everyone at III Points with an array of events devoted to an extensive journey down each path respectively, whether it's art, music, or technology that kindles your interests. Tickets are available, and are between $37 and $155. To purchase tickets click here. See you all out an about Wynwood this weekend. IIIPoints Festival from iiipoints on Vimeo.